Home » Science Notes Posts » Chemistry » Materials » Are Olympic Gold Medals Real Gold? In addition to the prestige of winning an event at the Olympics, the victor receives a gold medal. At one time, Olympic gold medals were real solid gold. However, the last time a solid gold medal was awarded was at the 1912 Stockholm Olympics. 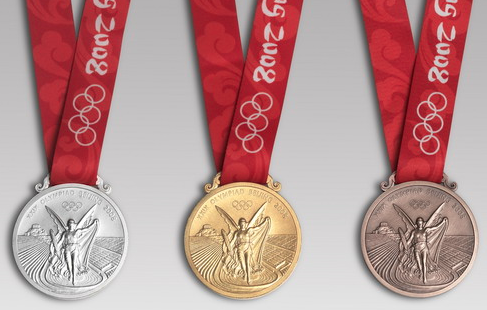 Modern Olympic gold medals are sterling silver that has been plated with real solid gold. The National Olympic Committee (NOC) allows quite a lot of leeway in the production and design of Olympic medals, but there are some rules and regulations that they impose. Gold medals are awarded for first place. The gold medal is at least 60 mm in diameter. Each Olympic gold medal is at least 3 mm thick. A gold medal consists of composed of silver, which must be at least .925 grade (Sterling silver). Each gold medal is covered with at least 6 grams of pure genuine gold. The name of the Olympic sport is written on the medal. Each host city gets to design its medals, but the NOC gets the final word on whether or not the design is accepted. The host city is responsible for minting the Olympic medals. The gold medal has not always been the prize for winning an Olympic event. The tradition of awarding gold, silver and bronze medals dates back to the 1904 Summer Olympics in St. Louis, Missouri, USA. Cups or trophies were awarded for the 1900 Olympics. Medals were awarded at the 1896 Olympic Games in Athens, Greece, but there was no gold medal. Instead, the first place winner was awarded a silver medal and an olive branch, with runner-ups getting a laurel branch and a copper medal or a bronze medal. The award for winning at the ancient Olympic Games was an olive wreath made from wild olive branches entwined to form a circle or horseshoe. The prize is believed to have been introduced by Heracles as the award for winning the running race to honor the god Zeus.